The personal information we collect will include your contact details: name, email address, postal address & telephone number as well as information you provide in any correspondence between us relating to your advertisement in the Littleport Life Magazine. Provide or administer activities relating to all our services: preparing advertisements for the Magazine and accounting purposes. Your personal information is stored securely, for no longer than is necessary. We carry out periodic deletion of data whose retention has expired and/or when the need to continue to hold such data is no longer necessary. 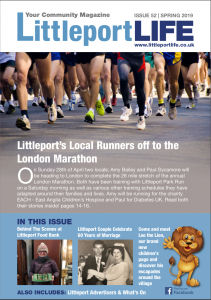 Data will be held for as long as you remain an advertiser in Littleport Life Magazine. The personal information we collect about you will be used by the relevant persons running the Magazine. We only keep information for as long as you remain an advertiser in the magazine. Offline, your personal information is kept securely in our databases. Paper information is kept in locked cupboards and offices with limited access.